I've checked... with some DV Type 1 sources happens such problem - silent audio. Great Davis, now it works perfectly. Fast accurate and simple; some people call it excellence. So, ffmpeg, used by HandySaw, in this case creates file in MPEG-1 format. It selects format accordingly destination file extension. And here destination file has same extension as source. Usually it is not a problem but in this case VLC cannot normally playback such files. 1. Change extension of source file to .TS - this is unambiguously MPEG-2 Transport Stream format. Despite source format still is MPEG-2 ffmpeg will read it and create result in correct MPEG-2 Transport Stream format. VLC plays it correctly. 2. 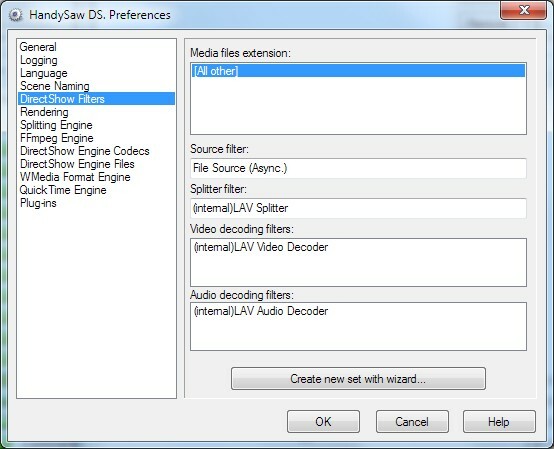 I created copy of "Direct Stream Copy" FFmpeg Engine preset and named it "Direct stream copy MPEG-2 PS". It is in attachment. Place it in HandySaw installation folder. In it I've added output format setting "-f dvd", so this preset will copy any source media regardless its format to MPEG-2 PS format files. VLC fails with your result and with my result files. You are indeed right in everything you say. But there is something strange because with VLC there is no sound and the audio codec information provided by VLC is different from that of the original file. For me this is a good file. With audio. Can you share some of you result "bad" files with me? Can you give me sample of your source video for tests? Please try to change extension of your video file from MPG to M2P, so it will be "B09 (2).m2p"
After follow your instructions the behaviour seems the same. Here you have the log file. 1. Looks like you changed default setting for filters. Why? It is better to keep it in default state. 2. Try to update ffmpeg. To do this please download https://ffmpeg.zeranoe.com/builds/win32/static/ffmpeg-latest-win32-static.zip and extract ffmpeg.exe from it over one in ffmpeg subfolder in HandySaw folder.